Numerous existing artifacts from the central and northern parts of the state of Veracruz indicate a preoccupation with some form of ritual ball game. 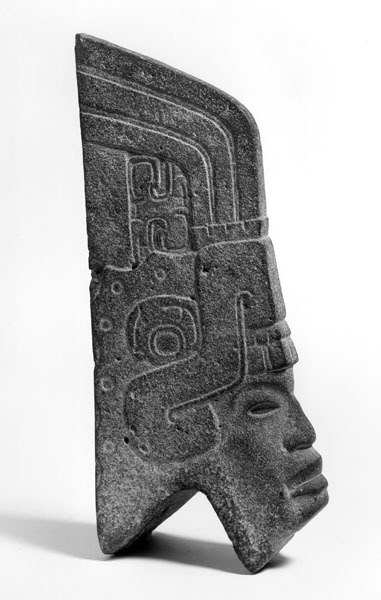 A culture known as Classic Veracruz produced three kinds of stone objects symbolic of the actual equipment used in the game: yokes, hachas (axes), and palmas (long, narrow stones). Stone yokes are the ritual counterparts of leather-and-wood yokes worn around a player's waist to protect him from the heavy rubber ball. Hachas and palmas were set on the yoke, in front of the player, possibly to help control the ball or as a component of the ceremonial dress. Hachas may have been used also as markers along the sides of the court. Scenes of death and the underworld, set within intricately carved scrolls, are common themes on these sculptures. Here a human face is framed by the curved jaws of an unidentified creature.